Growing up on Tobacco Road, in the heart of the ACC’s Big Four, allowed for a large dose of college basketball in my early years. I like to think I didn’t let that opportunity escape me, although my wife and mother may argue that my consumption is excessive. Regardless, The Greensboro Coliseum was one of the first venues where I had the opportunity to see a live college sporting event. Although you won’t see the Greensboro Coliseum on any “Top 100 Most Aesthetically Pleasing Sporting Venue” lists, or Jim Boeheim's wish list of arenas to play in, its history is supreme. Several ACC and NCAA titles have also been battled for in front of those 22,000+ uncomfortably ugly green stadium seats. Thankfully, in recent years, the Coliseum has made a few seat improvements. Arguably the most historic event was UCLA's 7-year NCAA championship run coming to an end in 1974 at the hands of David Thompson and the NC State Wolfpack. Another one the Coliseum's NCAA Tournaments took place in 2012, while hosting teams from the South and Midwest regions of the bracket. What seemed to be the case annually, although it may be a while until it happens again, Duke was afforded the opportunity to play their first two games of the Big Dance just a few miles from campus. A much smaller and off-the-radar Lehigh Mountain Hawks would be their first opponent. The energy in the building was certainly toned down from Cameron Indoor Stadium, but the concourse was packed. Speaking of a packed Greensboro Coliseum concourse. During the 1996 ACC Tournament, my brother, Chris, who was six at the time, got lost in the crowd following the semifinal games on Saturday. He had hurried ahead of my dad, other brother, Ryan, and me and was lost in the chaos. With all of the fans moving in one direction, a man could tell that Chris was lost and hoisted all 50 pounds of him up on his shoulders and began to walk against the grain. As he yelled out my dad's name, we saw Chris above the masses and he was returned safely. This is the same brother who the very next day during the finals had to pee with less than a minute to go in a one possession game. But that's a story for another day. Back to 2012. 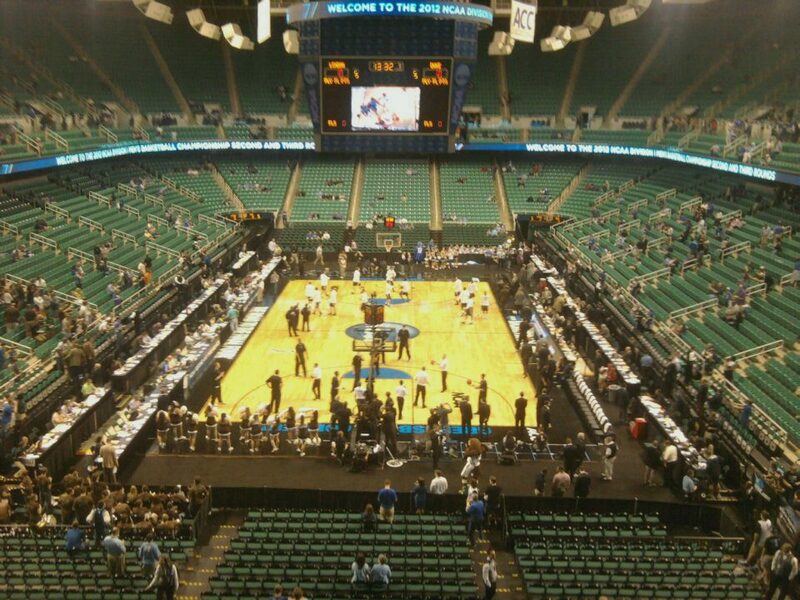 The Greensboro Coliseum emits a feeling of importance to most fans, myself included. When the teams run out of the tunnel and into the sea of green, turned ‘Duke blue’ on that evening, you know the game has significant meaning. Survive and advance. March 16th was no different. That night, most people expected the 2-seeded Blue Devils to sleep walk to victory. However, one of the nation’s top scorers, CJ McCollum, thought otherwise. The 15-seed Mountain Hawks backed that up with an 85-80 victory. As it had many times before, The Greensboro Coliseum hosted history that night. At the time, it was only the sixth 15 over 2 upset in NCAA Tournament history, as it had happened for the 5th time just minutes before tip-off. Prior to entering the arena, hundreds of people gathered outside to watch the end of the Missouri vs. Norfolk State game on a portable large screen TV. The excitement outside of the complex turned out to be foreshadowing of the events on the inside. So what did the fans experience that night upon their entrance into the arena? Aside from a historic tournament game, they would have engaged with some of the nicest and most professional staff in sports. Through the main entrance, walking down a long hallway accompanied by auxiliary rooms on either side, a group of semi-formal, vest-wearing Coliseum employees were waiting with a smile. If fans arrive without tickets, they can usually find a handful of scalpers, and other fans stuck with extras, waiting outside of the Coliseum’s annex building. This is a go-to spot for last-minute purchases. If you want to take a trip down Tobacco Road, consider The Greensboro Coliseum in March.